We're going back to the garage to finish a few things up today! For those of you that haven't been around for my garage organizations "series" (can I call it that? ), let me show you my to-do list. Let's talk bike racks. I showed my inspiration in this post, and have to tell you that I feel kinda lame for taking so long to get this done. This is a mucho simplified version of what I was picturing (I was hopeful to create two bike racks at an angle to be able to fit both in that space), but I think I often make things more difficult than they need to be. Wanna see how simple it is? 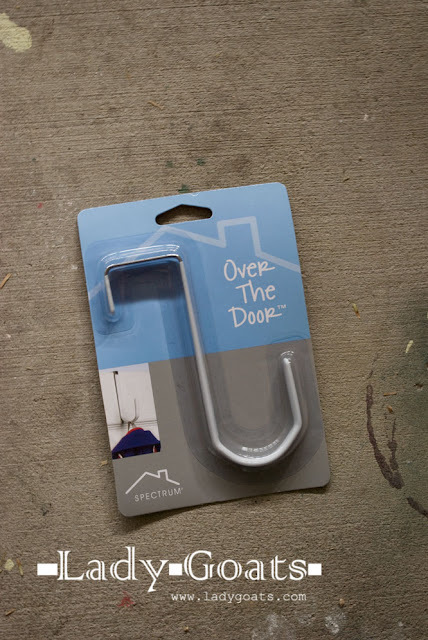 It's two 2x4s and a few over-the-door hooks. Let me tell you that this wasn't exactly a first-try success, though. My first attempt turned out like this. I made it 6 feet tall the first time around, but that didn't allow for enough room between the bikes (and my first hooks didn't work!). So I just took the tall board off and put a full-length stud in it's place. Sure, I could've probably cut a foot off of it, but... I'm lazy! And with this, all of the non-far fetched items on my to-do list are checked off!!!! 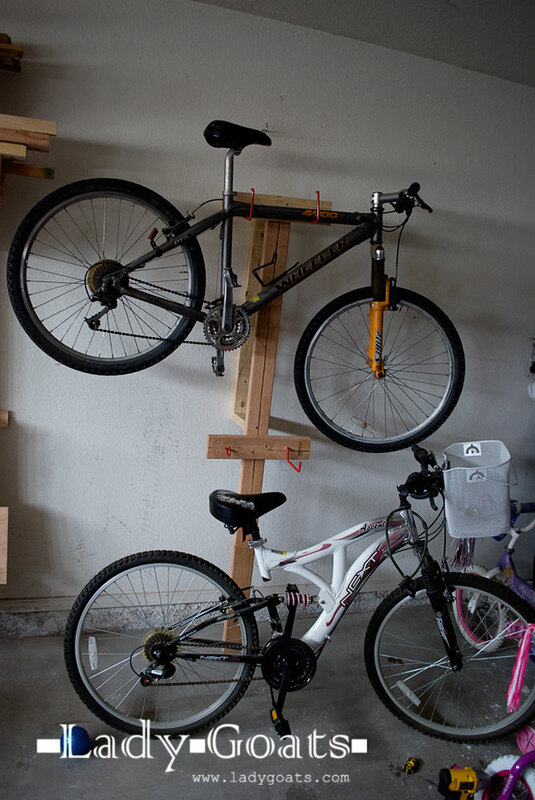 Are you making one for the Big Kid and Baby Goat's bikes? And while you are at it, for my kid who nearly lives there's bike? Very cool. We are moving in two weeks so my garage is a nightmare. I can't wait to get everything settled and in it's place again. YOU GOT A HOUSE?! How YAY! Haha! I can't stand moving. Sending good vibes to ya. This is such an awesome idea, my husband had put in a complicated hoist system and now it's never used. This looks so simple, and will definitely solve our 3258954698540798 bikes in the garage issue! Great bike rack stand. Really excited to see this. 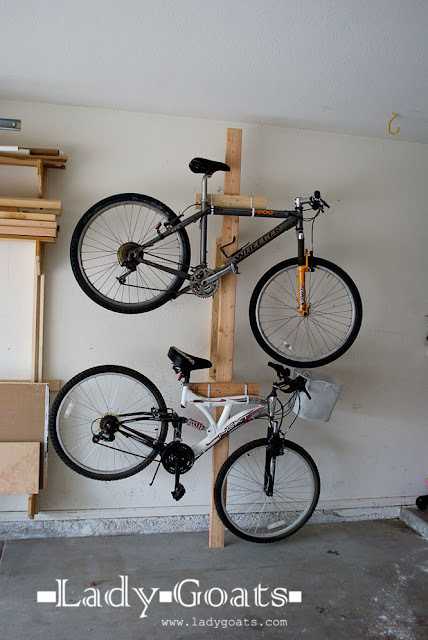 I want o make this bike rack stand. 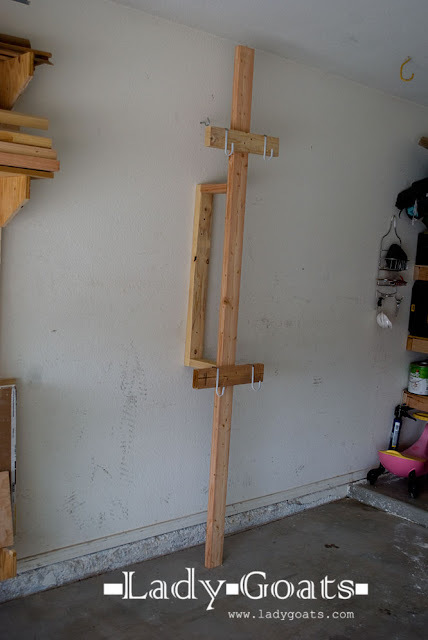 Did i want to know how can i make this bike rack stand?